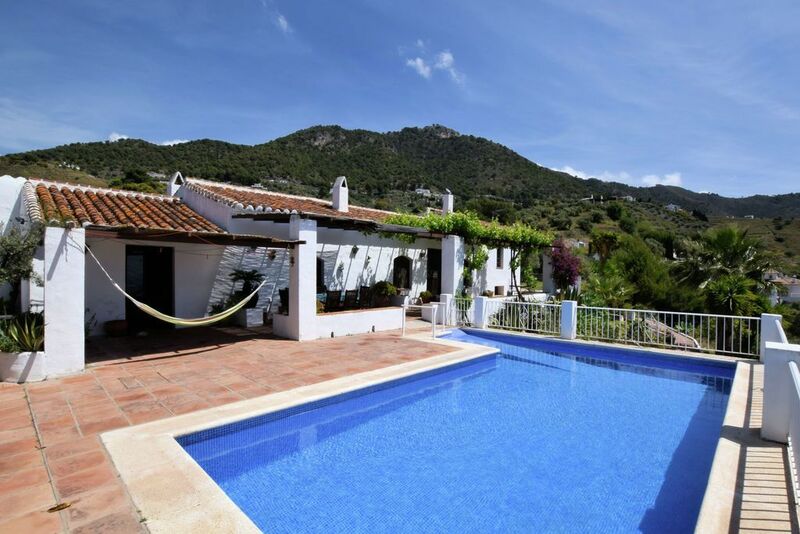 Very charming and spacious 250 year old rustic farmstead, situated in quiet area with splendid sea view. It was fully restored 6 years ago and has very good access. 1 mile up the road from the lovely old Arabic white village of Frigiliana and 3 miles from the lively town of Nerja with its beautiful Burriana Beach. The house has 4 bedrooms of which one can be used for 4 persons. It has a swimming pool, 3 terraces and a lovely big (4000 sqm) garden with tropical trees. The house has good access and offers lots of privacy behind walls that guarantee privacy. In the near environment you can walk, bike, ride horses and there are several restaurants within walking distance. Since the former owner was disabled, the house is 90% wheelchair friendly. The total house has central heating and therefore is also very comfortable during winter time! You can find more detailed information and pictures at our personal website (also available in English). About 20 years ago we, my wife and I, travelled through Spain for the first time. Before I was more interested in France since I was brought up by a Francophile father. My wife had been studying in Malaga and wanted me to see the beauty of southern Spain. I was immediately impressed by the unspoilt beauty and the wild nature you can find almost everywhere. After a few holidays driving around all parts of this magnificent country, we were struck by the perfect balanced True Spanish Nerja area. What started off as the well known window watching of estate agents soon became more and more serious. We have seen hundreds of houses. My wife loved to buy some kind of front line penthouse where I preferred an old and remote cottage. In the end we found in this little paradise the best of both ways. We bought this one of a kind house because my wife fell instantaneously in love with it. We had seen so many "not inspiring" houses that we realised that this was a once in a life time opportunity to become the owner of a piece of Spanish history. We have the intention to go and live here permanently in the future. It breezes the old Spanish atmosphere and is very luxurious without being too perfect or decadent. It's positioned in the second line from the beach. You can lay on the beach in 15 minutes and at the a same time you can immerse yourself in the peacefulness of the countryside. There is too much to be done. You can go for a walk in the mountains, go to the Sierra Nevada, visit the Alhambra, ride horse, go to the prehistoric caves of Nerja, enjoy a walk in prize winning Frigiliana. The most surprising advantage is the combination the tranquility of a country house on one hand and the comfort of a see side house on the other hand. This is because of the short drive the Nerja beach and having at the same time the shepherds who are passing by our house every day. The beautiful sea views in front of you and overwhelming mountain views behind you are also hard to describe. Every single room is very spacious with high ceilings and has a private see sights for you every morning to wake up. You can be in an unspoilt historic Spanish Hacienda with at the same time the all the modern facilities for summer and winter. Around the house there is so much to discover. We know the area so we can arrange almost anything. We do recommend make a guided walk with our local guide. 3 bathrooms (1 en-suite, equipped for disabled guests, 1 with a bath tub, 1 with shower toilet and sink). Toilets in every bathroom + 3 further toilets, in total there are 6 toilets in the property. Air Conditioning available in all four bedrooms. The fourth bedroom doesn't really need airco, but we do have a portable air-conditioning for extreme hot nights. We do have a central heating. Very comfortable for winter stays. Large living room in rustic style for at least 10 people, with a TV, stereo, DVD player, home library, two fireplaces and French windows to the terrace. Next to this living room there is dining room with old candle chandelier above the antique oak table. Large kitchen with separate dining space and all equipment including fridge, freezer, oven, washing machine, dish washer, citrus press, hob, coffee machine, food processor, toaster, microwave, mixer, tosti-iron. The kitchen has a round breakfast table. We do have a separate dining table. This an very large 3 meter long antique (Spanish) oak table. We have a DVD player and lots of dvd's, especially for children, but series like Mad Man and The Killing as well. 3000 M2 fenced garden. Very well kept garden with lots of palmtrees, cypresses and tropical fruittrees. A nice green lawn. The Sierra Nevada is only a 1,5 hour drive. There are two large golf courts in the nearby environment (15 mins drive). Mountain bikes, mountain walking, Horseback riding. etc. The house, swimming pool and garden is 90% wheelchair friendly and has been adjusted for this purpose by the former owner. There are no thresholds, all the doors are extra wide, sit-down shower and the house if full of grips. The pool has a wheelchair ramp. The kitchen is adapted for wheelchairs as indicated on our site. Notes on accommodation: The entire house has central heating. Air conditioning is available in the three bedrooms and we have a mobile fourth airco. Pets are allowed. There are 2 high chairs. Wi-Fi connection is available and included in the price. The house has a lot of privacy. Outside: Private swimming pool with Roman steps, 3 terraces, a barbecue and lots of parking space (behind gates). There is also a big gas tank, so filling is only necessary once a year. Large garden with lemon, orange, olive, almond and avocado trees. From every spot in the house you have a beautiful sea view (only 4500 yards as the crow flies). Utility Room: All necessary equipment. There are also three cots and two baby/ little children seats available. Cleaning / Towels / Linen / Maid service: Linen and duvets as well as towels and beach towels are included. The property is being cleaned after every stay. We can also offer an 'in between' cleaning for longer stays. Other: All rooms are fairly very spacious with boxspring beds. The house is as per the pictures shows. It is up in the hills behind Frigliana & on the edge of the National park. The house is v well equipped, has a well maintained pool & a lovely garden with a magnificent view. The host, Adrian, is v responsive and keen to help & the manager was great, taking us up to the property on our arrival at night. That was needed as the road up is v steep and twisty with a few hairpins. My main issue was that the house is nearly 5km (up a steep road) from Frigiliana (one of the pretty white towns in costa del sol) & not the 1 mile described in the website & about 11km from Nerja rather than the 3 miles in the describtion. So it is quite isolated though there are a couple of restaurants nearby & in the summer they are open later & of course it would be bright rather than dark & cold (one had no heating the day we went & was feezing). We would not have taken the place had the correct milage been given. We were unlucky with the weather initially & the house is v much a summer house as its large & a bit drafty, though it does have central heating. It is v lovely & prob is v cool in summer. Also the chimmney wasn't working v well & we had a house full of smoke the second time we lit the fire & so were unable to use it again which was a shame. In diesem stilvollen Haus haben wir uns mit zwei Familien sehr wohl gefühlt. Alles ist liebevoll eingerichtet und bestens gepflegt. Wichtig ist, dass sich das untere separate Schlafzimmer außerhalb des Hauses befindet, also ideal für größere Kinder und Jugendliche ist, die die räumliche Trennung nicht fürchten oder gerne etwas Ruhe für sich haben. Der Blick ist einzigartig! Die Lage ist ideal, weil man spanische Kultur und Wanderungen in beeindruckender Natur mit einem Aufenthalt am Meer verbinden kann. Unsere Ausflugsziele Granada, Malaga, Höhlen und Strand von Nerja und natürlich Frigiliana waren sehr gut zu erreichen und die Semana santa ein großartiges Erlebnis! A fabulous property. Spacious, traditional with everything you could possibly need. Clean and comfortable with excellent outdoor and indoor space. We were 2 families of 4 and there was plenty of space for all of us. The view is exceptional, the pool an absolute bonus and of course not forgetting the lovely Antonio who is on hand to help whenever you need it. Will absolutely return again. Don't hesitate, just book it. We stay in the house for 2 weeks. We loved the house, garden en swimmingpool. Frigiliana is a nice village in the mountains en near the sea. You can make nice walkings in the neighbour! Great large house, with all equipments needed. We were with a group of 8 persons, all different ages, and really loved it. Rural setting, few nice restaurants nearby, great place to start a walk deep into mountains. Swimming pool perfect for the kids and large garden to play (watch small children). Clean property and well maintained, loved the housekeeper/ manager! Would really recommend this propery to anyone! Restaurant we loved was at acebuchal. One of the loveliest places ever been!! We had the greatest holiday last autumn, not in the least because of the great atmosphere of Cortijo Los Almendros. Spacious house, good beds, clean, good service of the owner and their maintainer (who speaks English perfectly). The views are amazing from every point of the garden, house. And although it's a quiet area, there are a few good bars and restaurants within walking distance. We recommend this place to anyone and will be back for sure!! The famous beach of Burriana is 5 miles away. There are also more quiet beaches, like Maro's, Cantarrijan, or La Herradura. The beaches at the east side of Nerja are very quiet and charming and isolated. We will provide you with all the information in our 'Guest Guide', specially written for our clients. 37 miles from Malaga airport by a new, excellent highway. Hiring a car is strongly recommended, because of the distance from our house to the nearest bus stop. Nerja: 7 km. Frigiliana: 3.5 km. Malaga: 63 km. Granada:100 km. The house is situated on the road from Frigiliana to Torrox. Close to the house there are three good restaurants within walking distance. There are possibilities to walk, horseriding and biking. It is a 5 minutes drive to Frigiliana, a charming, old white village. There are shops and some very nice bars and restaurants. Nerja is only 15 minutes by car. It is a lively town, with shops, supermarkets and lots of nice restaurants. Booking Notes: We will ask a 30% deposit to guarantee your reservation right away. Afterwards we will send you a rental agreement. 6 weeks before your stay we will send you a reminder to pay the rest of the balance and the breaking deposit. The breaking deposit is € 300 and will be refunded after your stay. When there are more than 6 people in the house we ask for an additional € 75 per extra person. We ask €100 for the costs of the cleaning and €60 service costs (for bedding cloth, towels, electricity, gas, wi-fi, guest guide, welcome package etc). Changeover Day: Normally in high season on saturdays. The rest of the year in consultation with the owner. Prices are all inclusive. So Wi-Fi, Cleaning, linen, duvets, gas. electricity, pool and beach towels are all included in the price. Discounts available for long lets, only in low season (November-March). During low season costs for gas will be charged separately.